40 of the BEST Light & Easy Gluten Free Recipes filled with fresh ingredients and flavor! 40 of the BEST Light & Easy Gluten Free Recipes – recipes for breakfast, lunch and dinner all made with fresh ingredients and filled with flavor! I know a lot of people who eat “gluten free” now. Some people do it for medical reasons. Some do it because they have an intolerance. Some do it because they BELIEVE or THINK they have an intolerance. And some do it because it’s the “thing” to do. I eat that way when I can, not because I have to or want to. But more because it’s pretty easy to do and to go without gluten works for us. I do, however, notice that I don’t feel as bloated when we are conscious of gluten so I do feel better. 🙂 And for that reason I wanted to give you guys a roundup of some of my favorite …. and in my humble opinion 40 of the BEST Light & Easy Gluten Free Recipes out there! 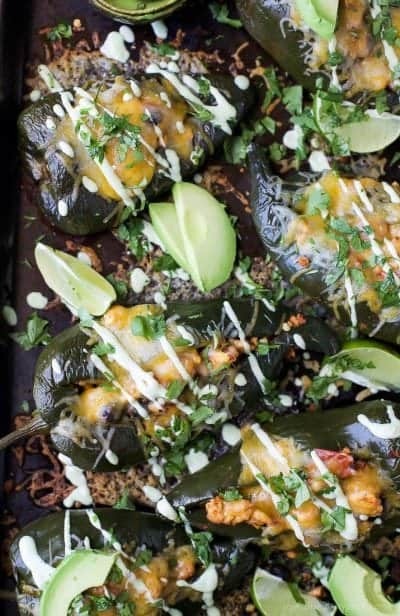 Not only are they absolutely gorgeous to look at, but they are filled with flavor and super easy to make. 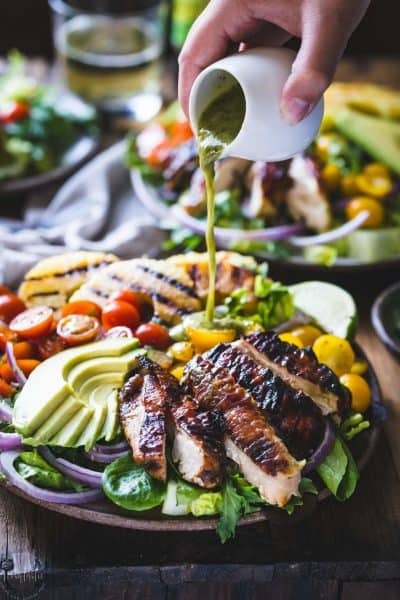 Every last one of these are must makes, so go ahead and pin this post to your Pinterest boards and start putting them on your meal plan. 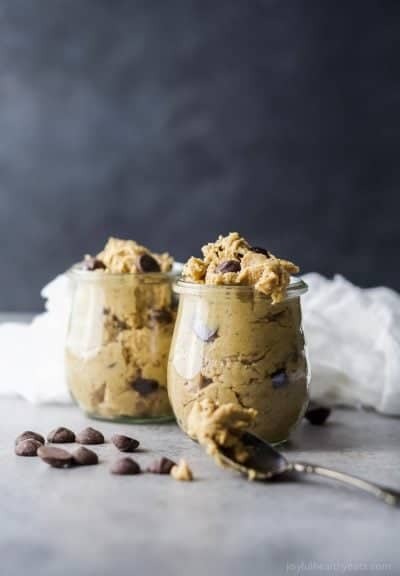 Vegan Chickpea Cookie Dough made in a blender. 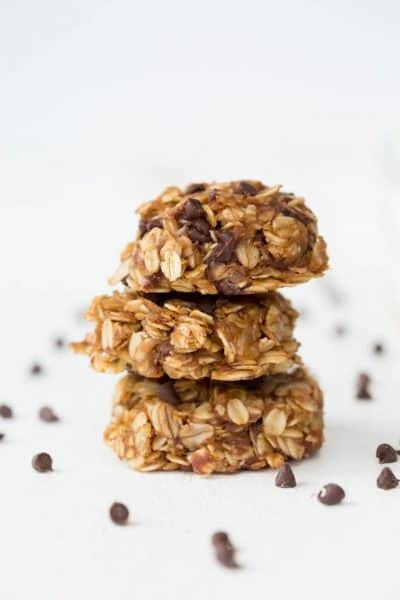 A healthy eggless no bake cookie dough recipe to satisfy that sweet tooth! 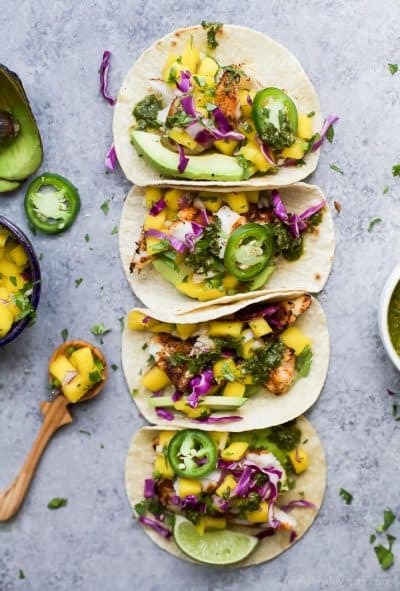 30 Minute GRILLED FISH TACOS topped with a fresh MANGO SALSA, Avocado, and Chimichurri! 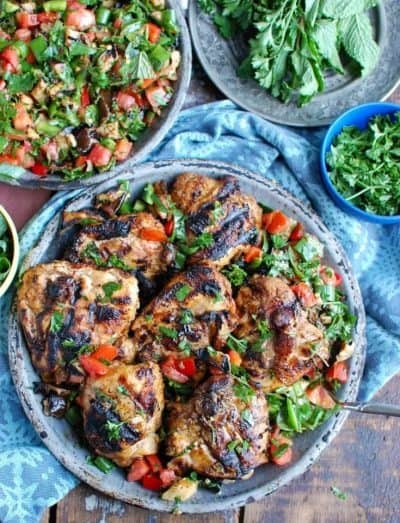 This easy grilling recipe is one “winner” of a meal that you’re family will fall in love with! 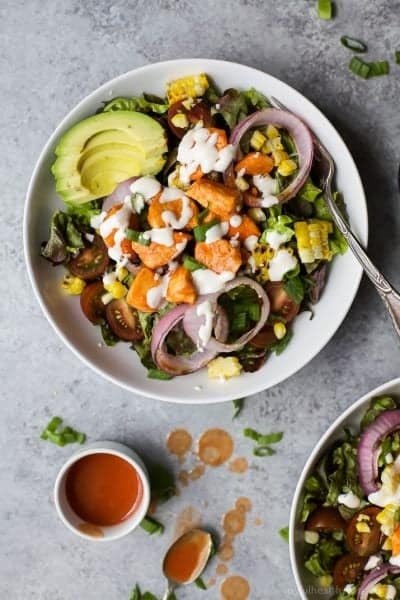 Grilled Buffalo Chicken Salad an easy 30 minute recipe smothered in buffalo sauce and filled with grilled vegetables for one delicious bite! 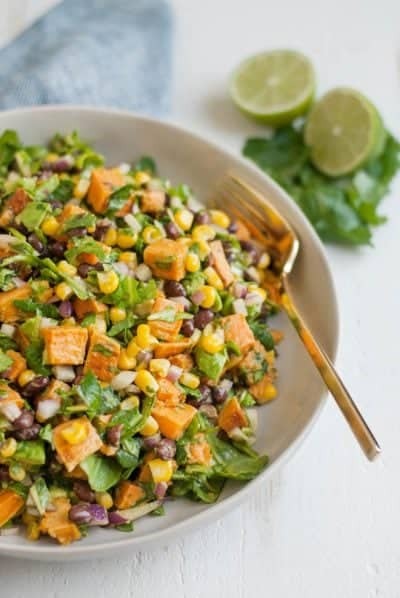 Summer salads never tasted so good! 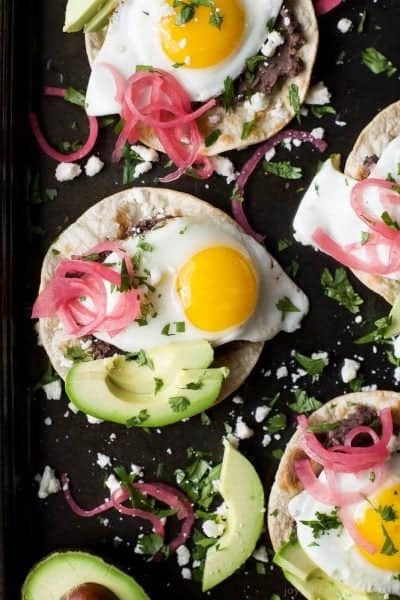 Healthy Huevos Rancheros Breakfast Tostadas topped with creamy avocado and pickled onions. 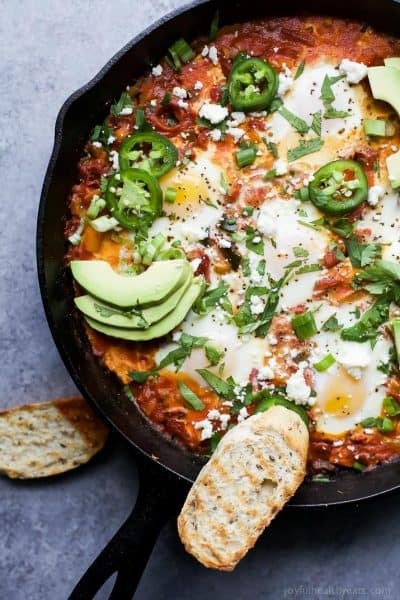 These breakfast tostadas are a delicious breakfast option that are high in protein and fiber with only 292 calories a serving! 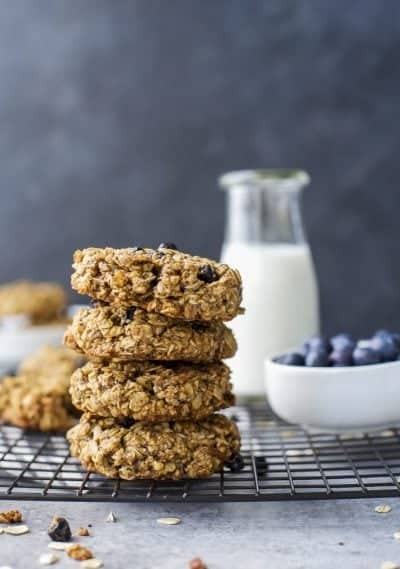 A Gluten Free Blueberry Breakfast Cookie baked to perfection, moist, naturally sweetened, high in fiber and perfect for a grab ‘n go breakfast! These cookies will rock your world! 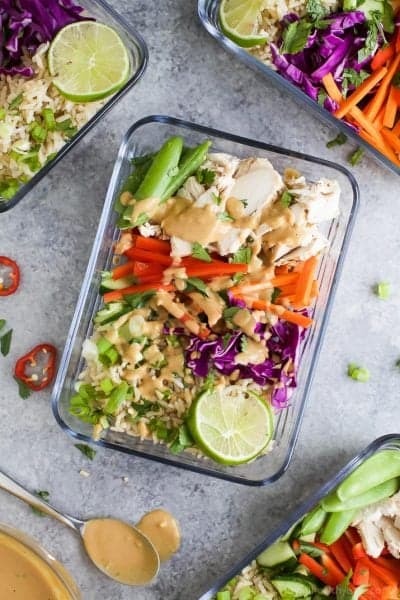 Easy Thai Chicken Grain Bowl drizzled with a Creamy Peanut Dressing. 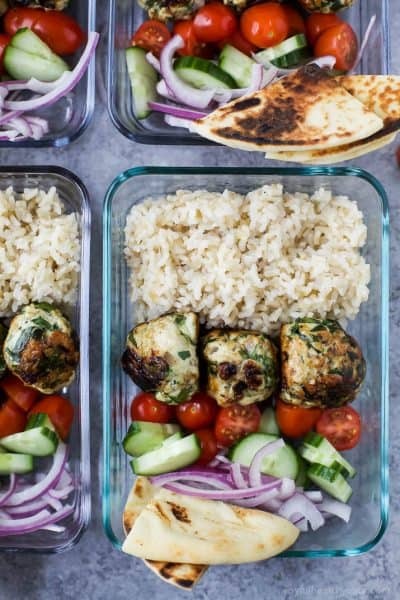 These Grain Bowls are filled with veggies, thai flavors, 17 grams of protein and come together in 15 minutes. The perfect start to a healthy new year! 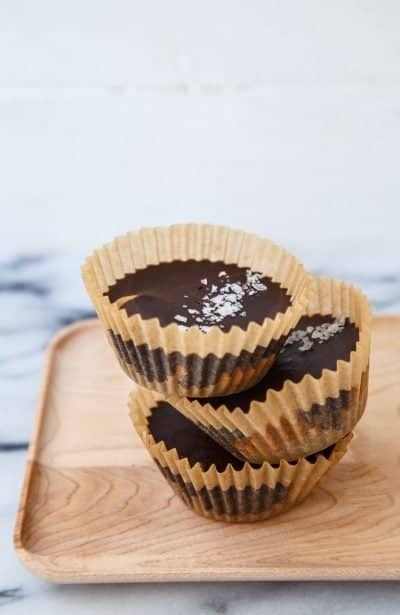 Homemade Peanut Butter Cups using simple ingredients! 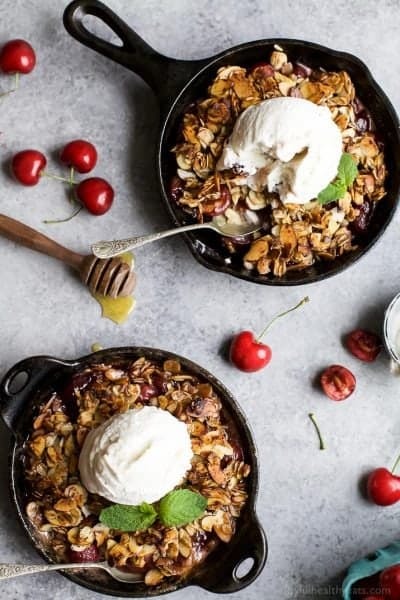 Gluten Free Cherry Crisp using fresh cherries, honey, and almonds! The ultimate HEALTHY cherry crisp recipe. 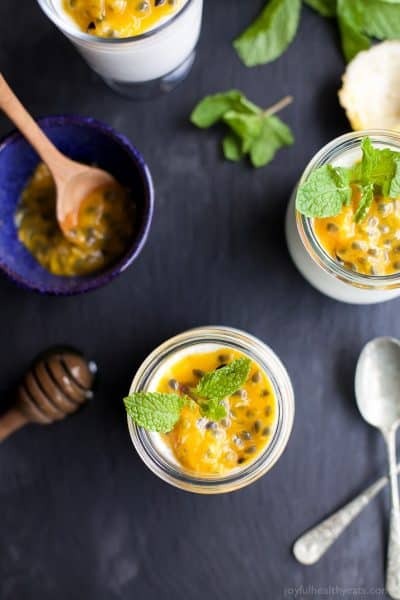 It’s the perfect dessert recipe for the spring and summer months! 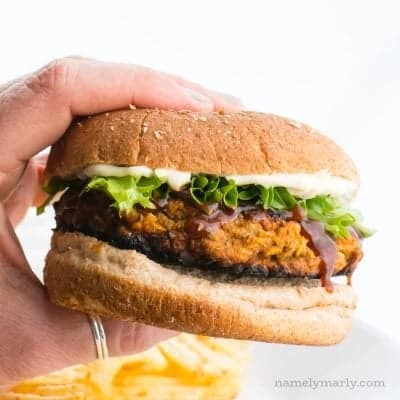 This Lentil Burger is the ultimate in tasty veggie burgers that you can make right at home! 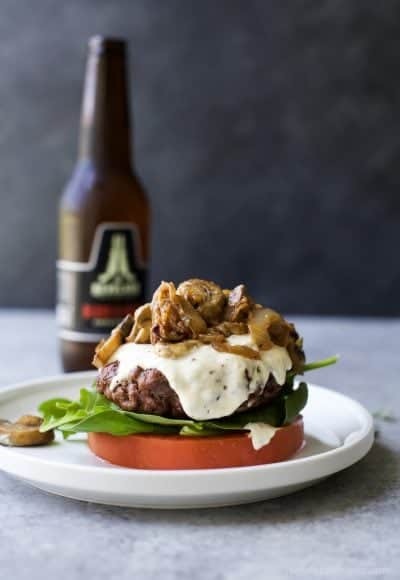 Inspire yourself and others with this healthy patty that’s high in fiber, folate and flavor! 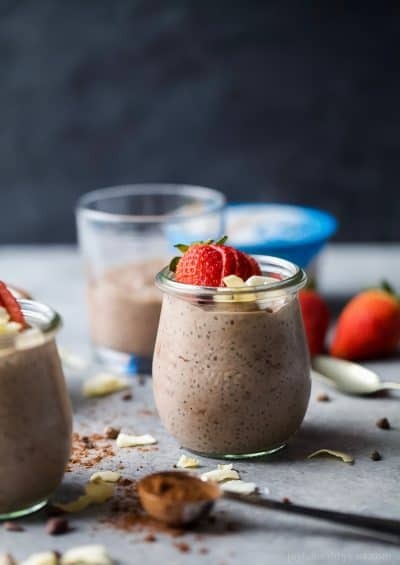 Coconut Dark Chocolate Chia Pudding – a creamy guilt free dessert that’s dairy free and only 120 calories a serving. 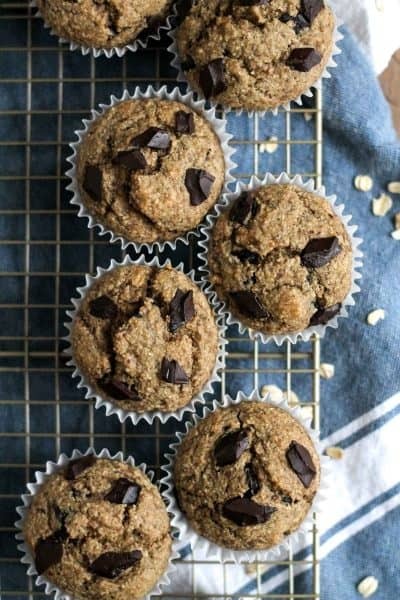 Banana Oatmeal Chocolate Chip Muffins: you would never believe that oats, bananas, and yogurt could together create something this amazing…until you try them. 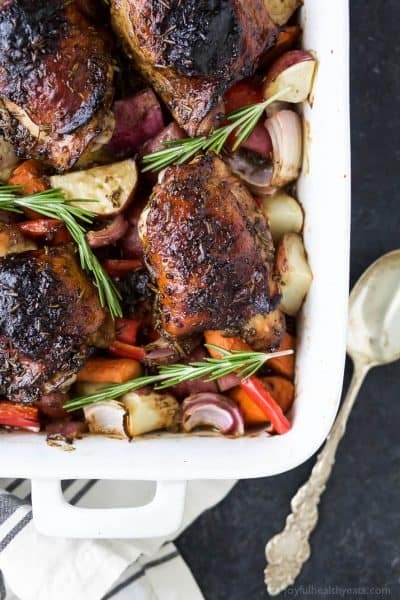 Easy One Pan Balsamic Chicken with Roasted Vegetables – a healthy paleo & gluten free recipe your family will devour! 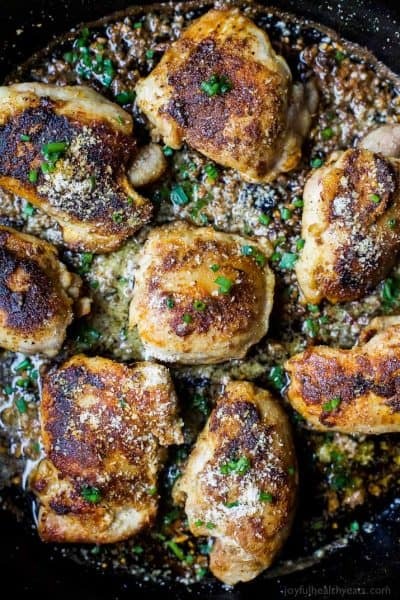 Tender juicy chicken covered in a sweet balsamic glaze has this one pan chicken bursting with flavor! 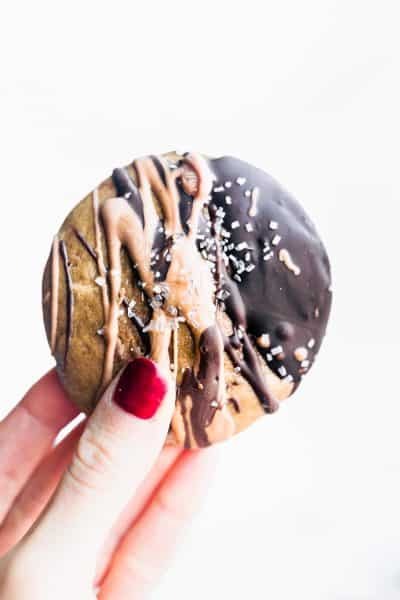 Dark Chocolate dipped Almond Butter Breakfast Cookies, paleo friendly breakfast cookie made with simple wholesome ingredients and unrefined natural sugars. 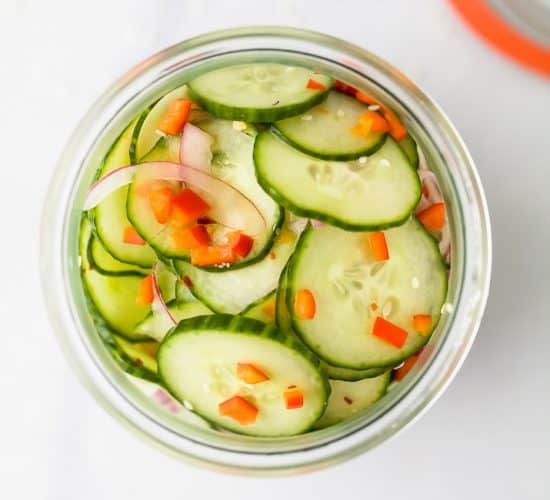 Portable, easy, delicious! 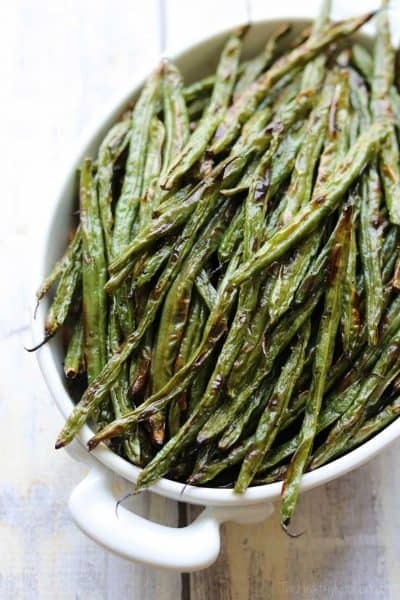 These Blistered Green Beans are the perfect accompaniment to practically any meal! 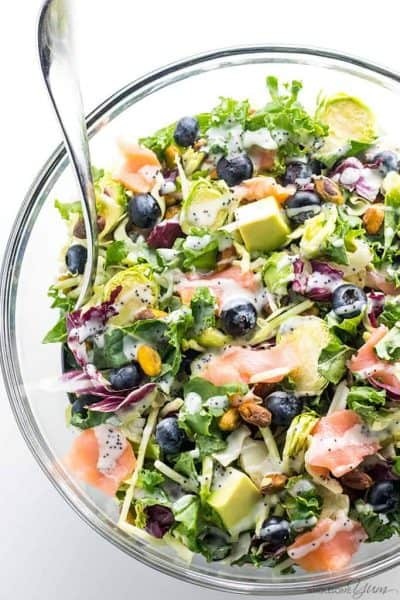 Easy sweet kale superfood salad with lemon vinaigrette, smoked salmon and avocado is like a better Costco kale salad. 5 ingredients, plus 5 in the dressing! 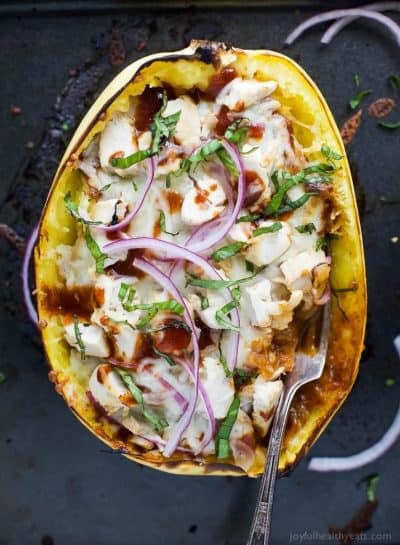 Easy Low Carb BBQ Chicken Pizza Stuffed Spaghetti Squash – filled with sweet tangy BBQ sauce, 22 grams of protein and gooey cheese. All your favorite things about BBQ Chicken Pizza for under 300 calories! 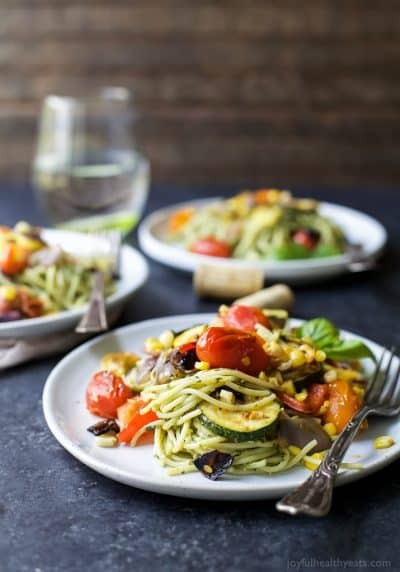 Basil Pesto Pasta tossed with fresh Grilled Vegetables a 30 minute meal your family will love! 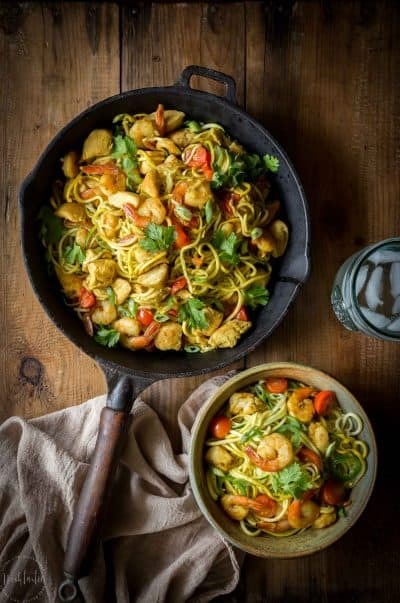 This light fresh gluten free pasta recipe will quickly become a summer favorite! 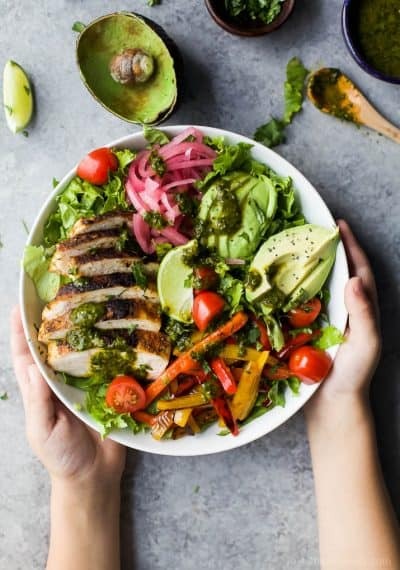 Cilantro Lime Chicken Salad, made with grilled pineapple, red onions, avocado, cherry tomatoes and served on a bed of lettuce. Healthy, Paleo and W30. 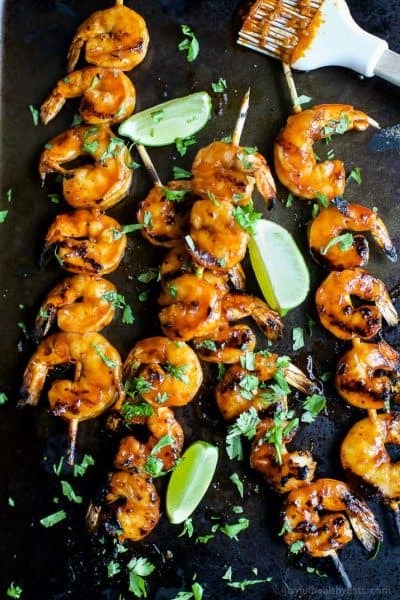 Honey Sriracha Grilled Shrimp these are hands down the BEST grilled shrimp you’ll ever have and the Honey Sriracha Glaze is totally swoon worthy! Greek Yogurt Cheesecake for two, the perfect light healthy sweet treat! 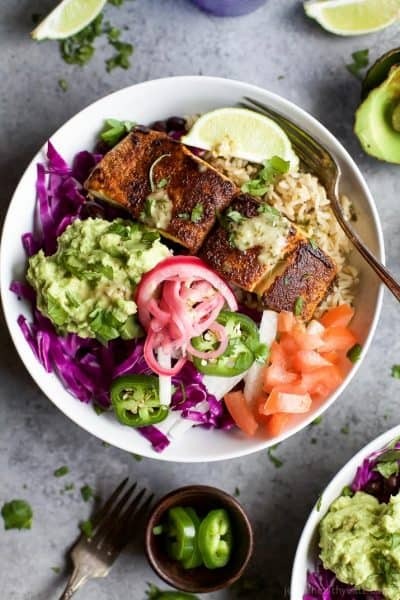 FISH TACO RICE BOWLS with avocado and pickled onions, topped with a Cilantro Lime Dressing! 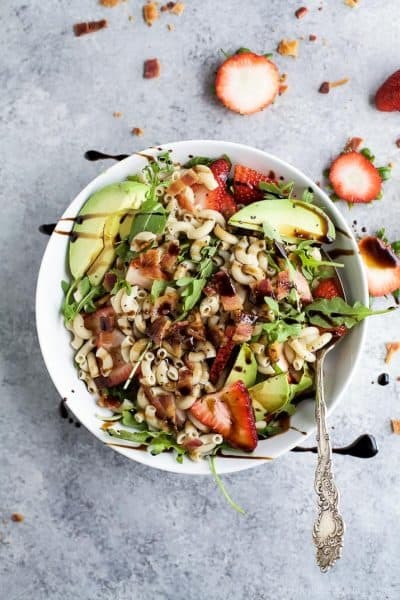 The perfect 30 minute meal to satisfy even the pickiest of eaters! 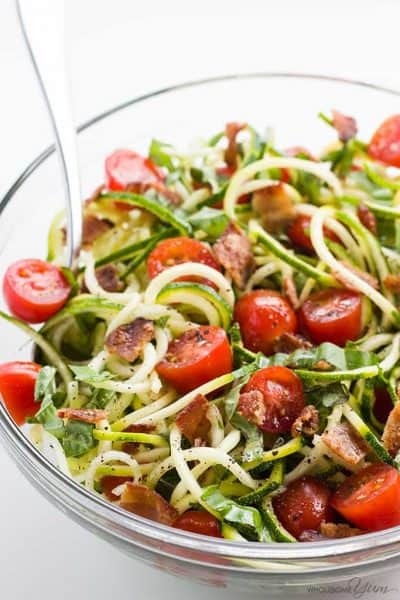 This cold zucchini noodle salad recipe is a delicious, healthy way to enjoy raw spiralized zucchini noodles. 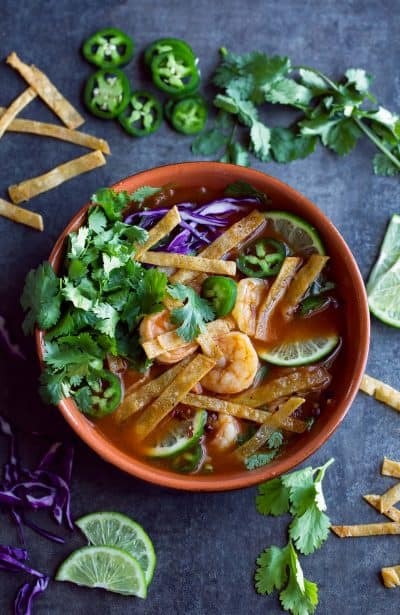 Quick & easy with common ingredients! Snack healthy with No Bake Raspberry Protein Energy Bites (gluten free + vegan). 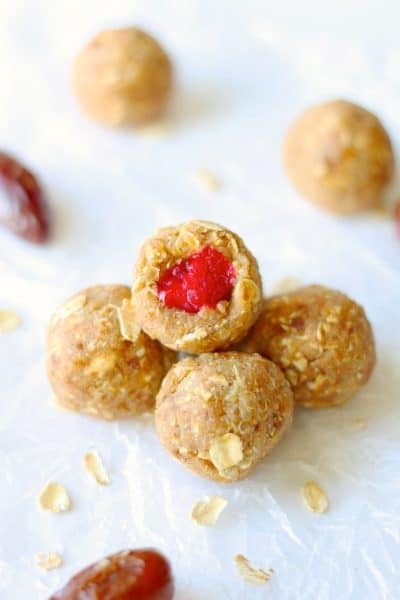 These raspberry energy balls are dairy free, naturally sweetened with dates and have a raspberry center. 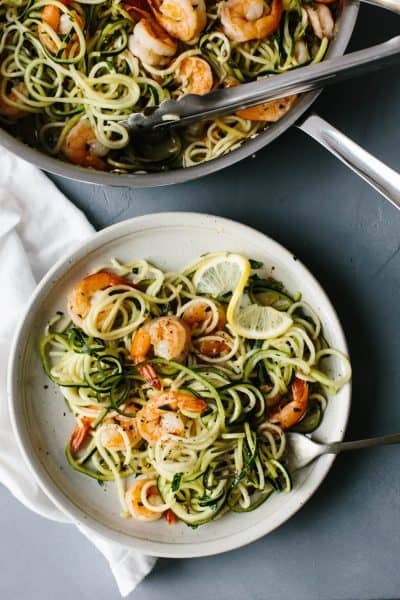 Healthy zucchini noodles “zucchini pasta” are tossed with lemon garlic shrimp for an easy, family favorite dinner recipe. 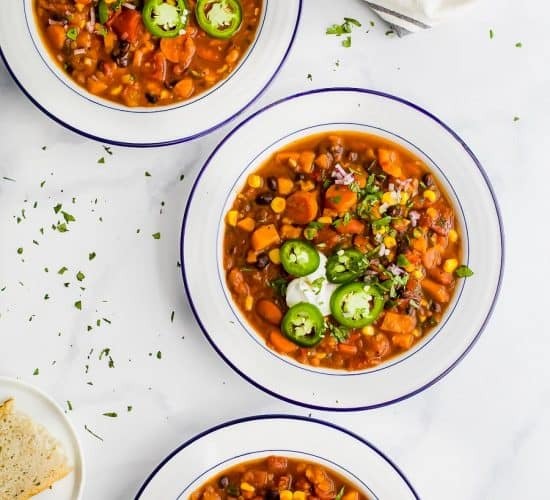 It’s naturally gluten-free and paleo-friendly and can easily be made Whole30 by replacing the white wine with chicken broth. 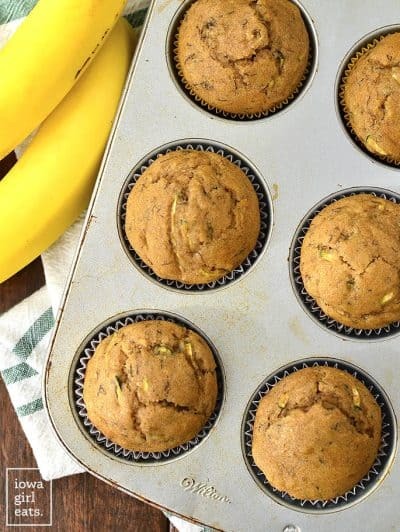 Healthier Zucchini Banana Bread Muffins are soft, squishy, and just sweet enough. 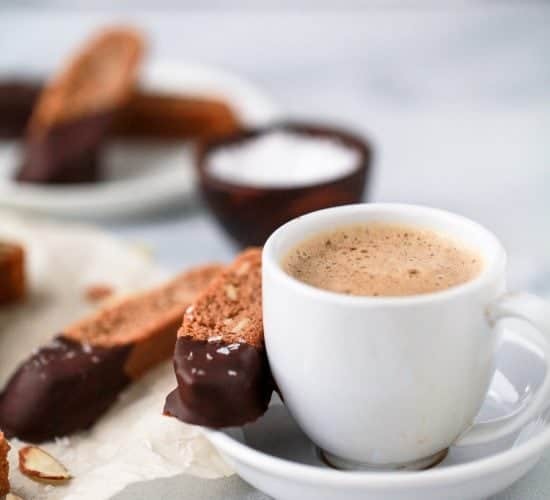 Pair with coffee or tea for a tasty, gluten-free snack or breakfast idea! So many fantastic options! I’m going to start with the homemade peanut butter cups and work my way through the rest of the list! Thank you for providing such an array of gluten-free options! That chickpea chocolate chip cookie dough; OH MY!!! 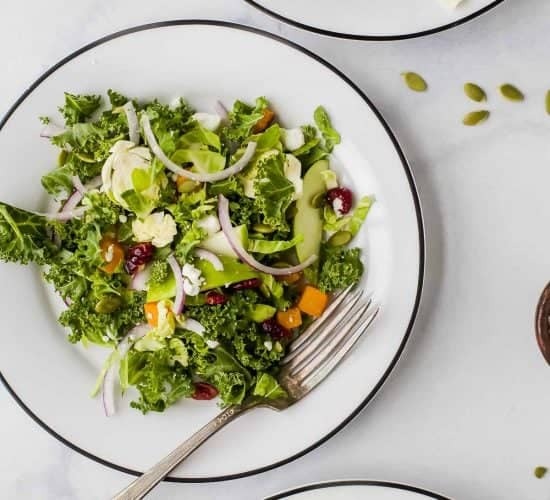 And the superfood kale salad. Wow, Krista! These all look amazing. I’ve book marked this page on my computer for easy access! Oh thank you so much Jenny! 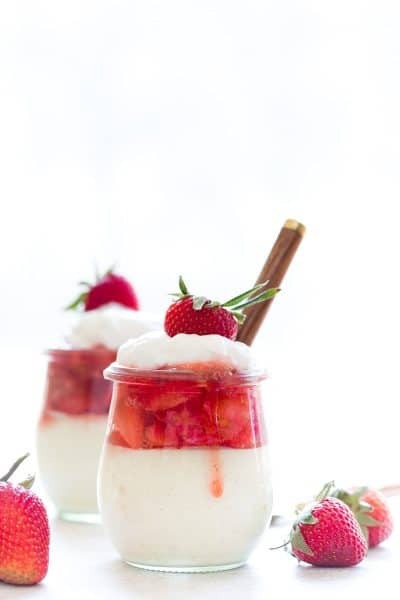 Hope you can make a couple of these over the summer, they are absolutely delicious! WOW!!! Everything looks incredible!! I want them ALL!! I don’t avoid gluten but I do make gluten free recipes because not everything needs gluten!! Some of my favorite recipes are gluten free. I see so many here I’d love to try! 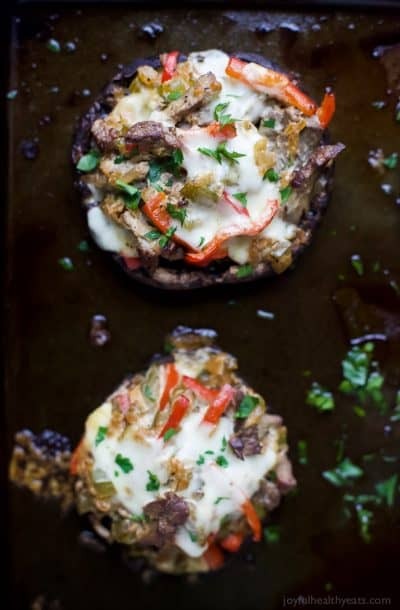 These look so totally amazing! Pinned! Such a great resource! Especially with spring and summer coming up! 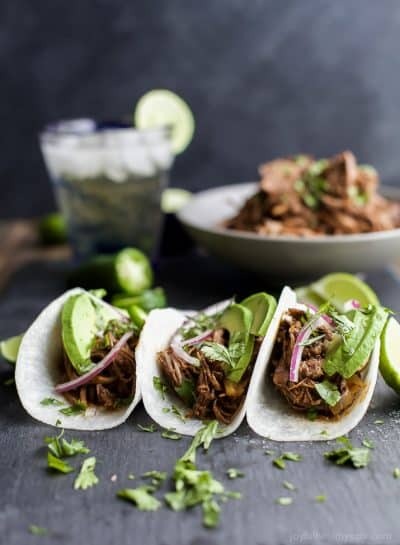 What a great round-up of gluten-free recipes. I will be making a few of these very soon. These are really great suggestions! Would love to try all these!